2900 Rich Acres Drive. 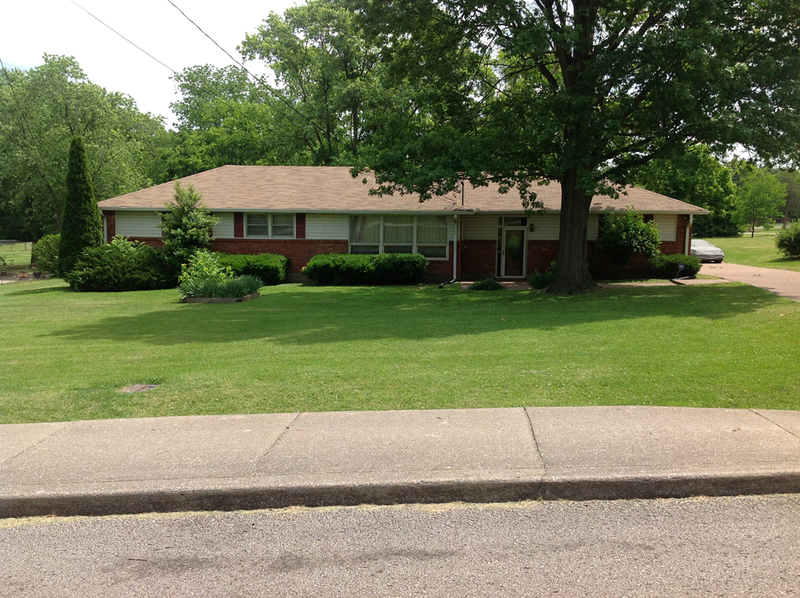 There were six big trees in a row across the front yard when I lived there, all of a different species. When you see that, you know there was once a fence there, which would have been a fence dividing fields on Hillhurst plantation. You can’t plow close to a fence, so trees spring up in what we always called a fence row. The tree in this photo was not from the plantation. My father planted it when the elm that stood there died of Dutch elm disease. It always looked bad because it was so much shorter and skinnier than the other trees. Now look at it. I once split my side laughing when a neighbor’s dog chased our cat up the elm tree. The dog was eight feet off the ground before it remembered that dogs can’t climb trees. The look of panic on that dog’s face as it ran back down the tree trunk was priceless. Or, to invert the letters as is commonly done, the look of panic on God’s face as it ran back down the tree trunk was priceless. 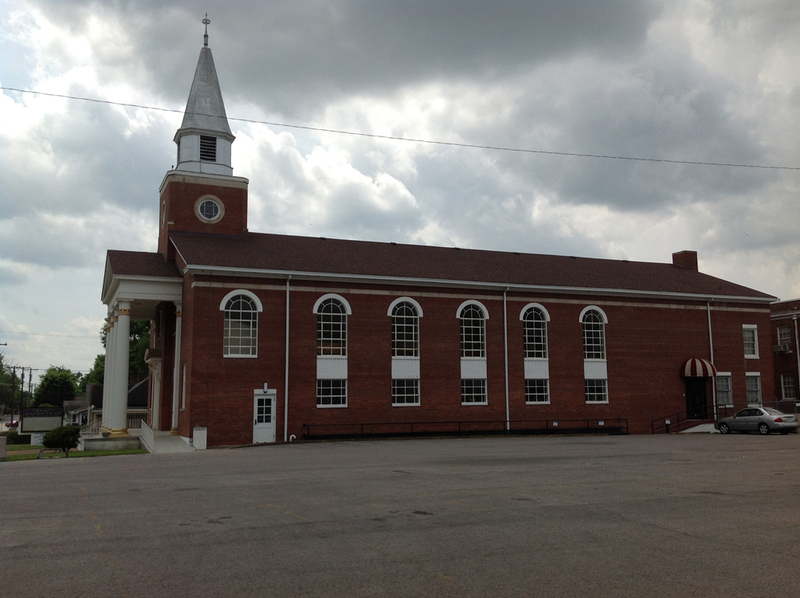 The former Grace Baptist Church. And just a small part of its enormous parking lot. 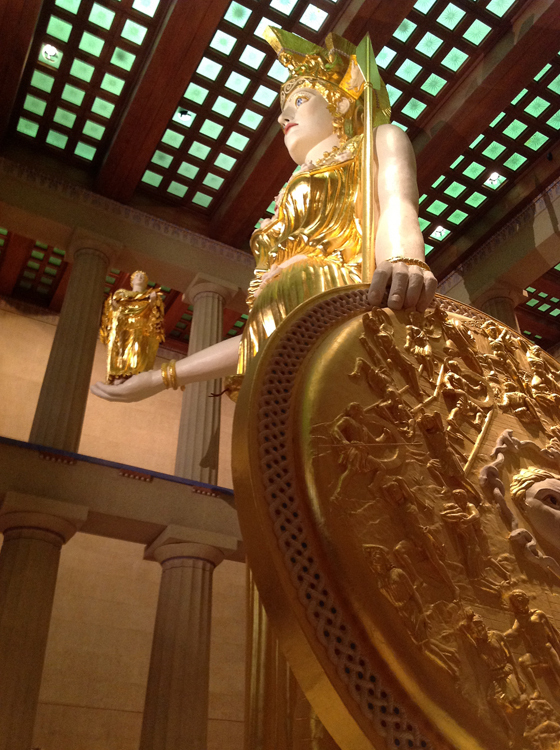 Someone has put some gilt on the columns. 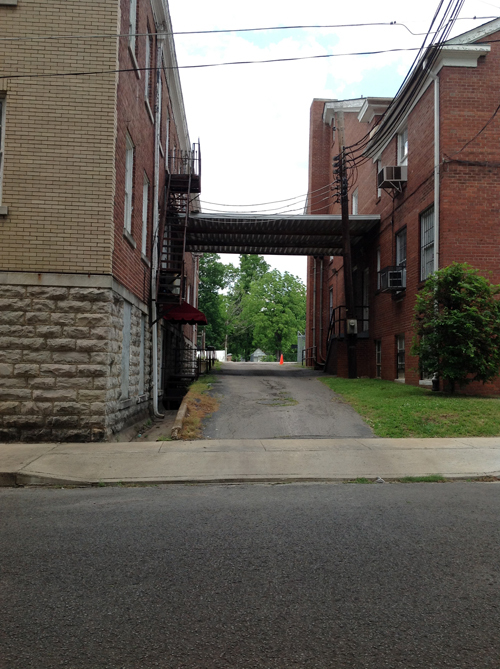 The alley between the old and new sanctuaries at Grace Baptist. 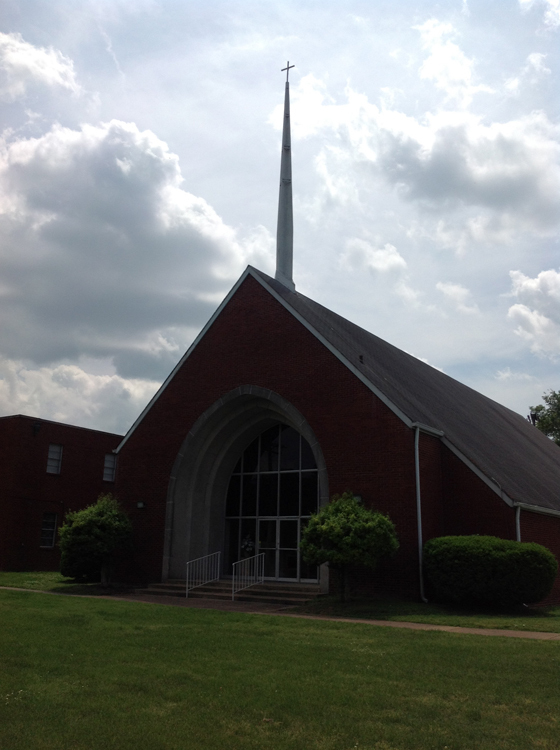 The awning above was just large enough for the smokers in the congregation to huddle under when it rained. 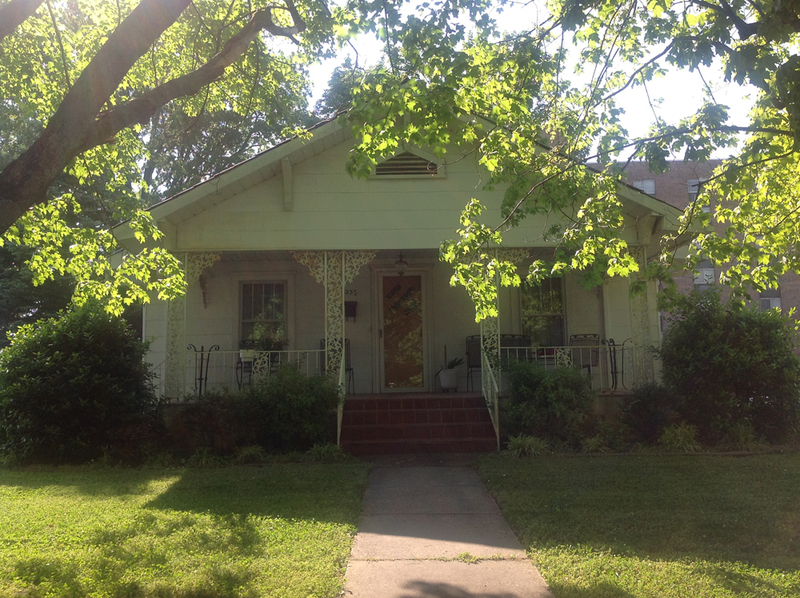 Nanny’s house. There was no cyclone fence back then. There was a narrow sidewalk leading to the back yard, planted with every color of iris, which is the Tennessee state flower. Planted, that is, until Nanny decided she’d had enough and mowed them down with her lawn mower. That was how she was with plants. She would emerge from the house in the afternoon while we kids were smelling the honeysuckle that grew along a hedgerow out back. She would slay a couple of bushes, then retreat into the house for iced tea. Destruction was the secret of her green thumb, since nothing ever died, but just sprang back into evermore abundant life. There is no life without death. 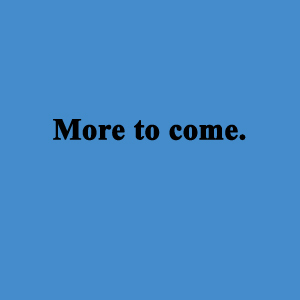 3004 Lyndale Drive. 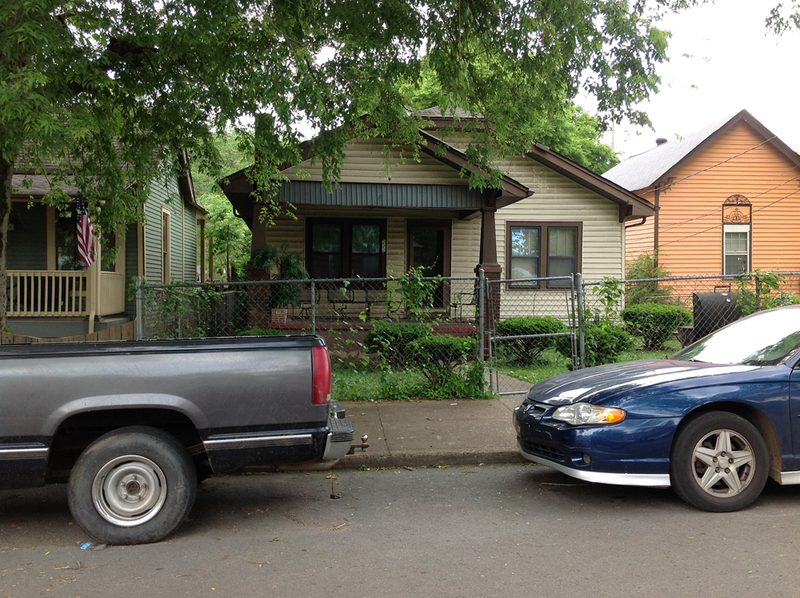 The pink house where Mama Fields, Bee-Pa, Annelle and Other Mother lived, three blocks away from us. Somebody needs to cut those bushes back. My favorite place on earth as it appears today. 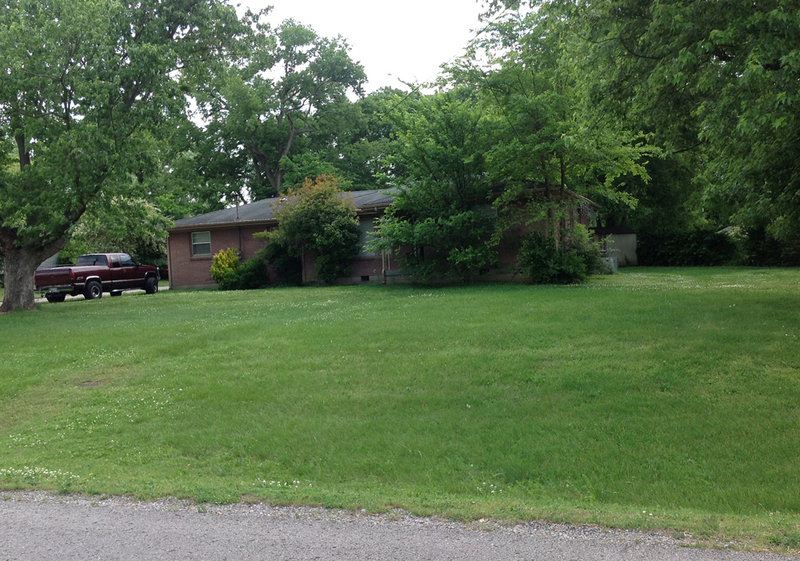 My great-grandmother Susie’s house once stood here. Peoples Street, where my mother’s father’s family lived. 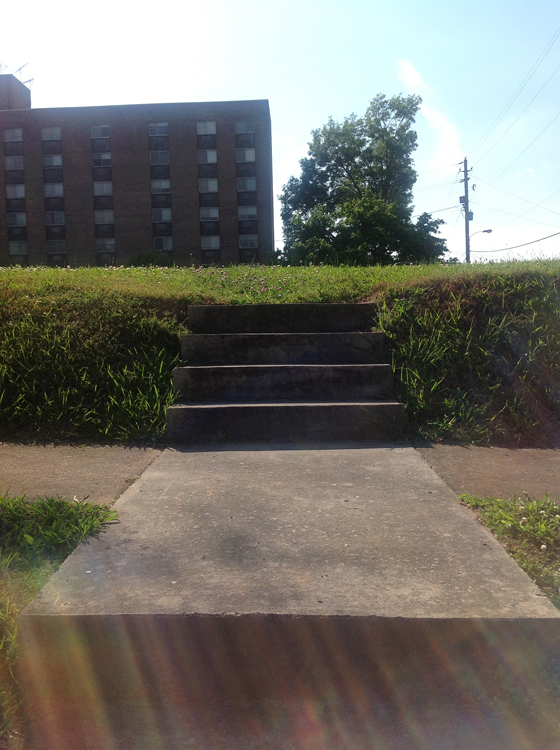 These steps once led to the house where my mother was born. My mother’s cousin Grace’s house. The last house standing on Peoples Street. 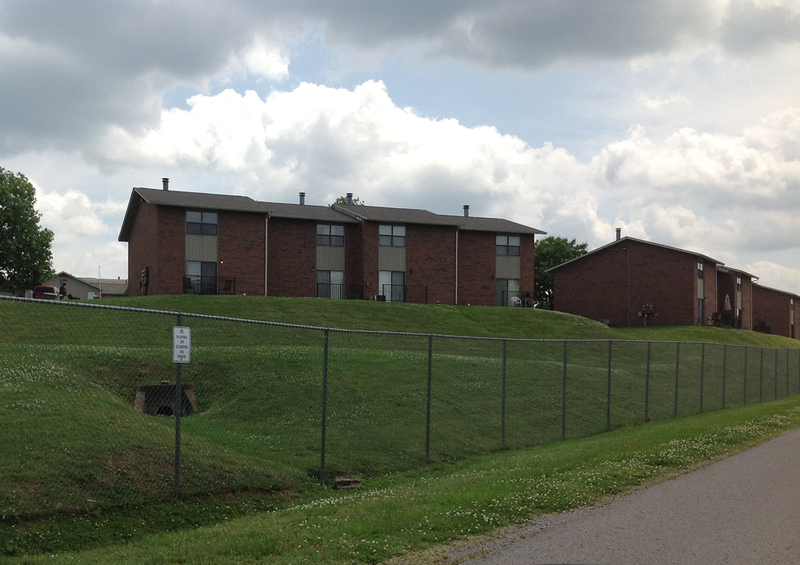 Hillhurst Apartments. The clouds are beautiful. The former Hillhurst Baptist Church. 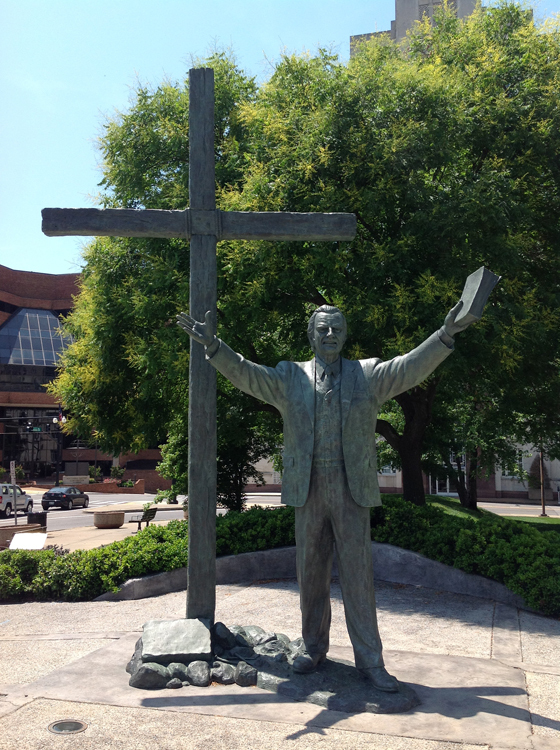 Billy Graham was the holiest Southern Baptist who ever lived. 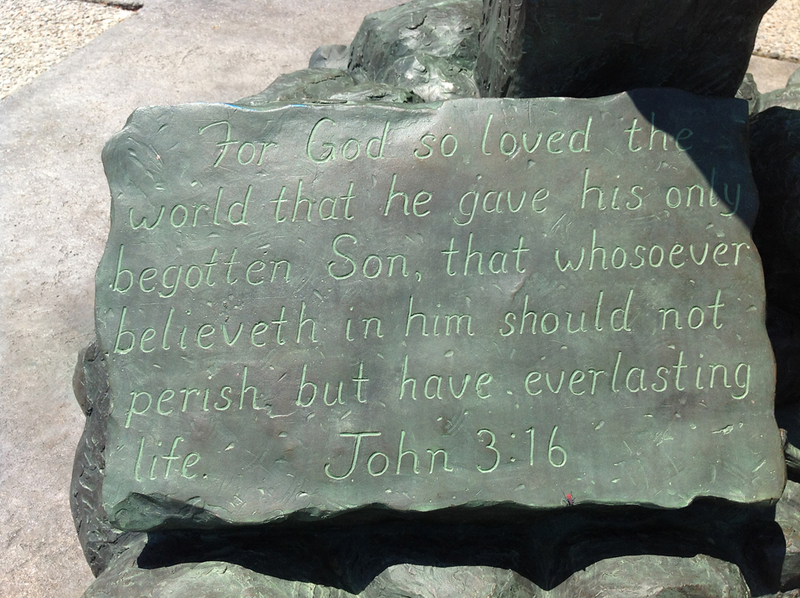 John 3:16, the first Bible verse that Southern Baptist children learn by heart, here seen carved in stone at the stone feet of Billy Graham. This verse is the bedrock of Baptist faith. 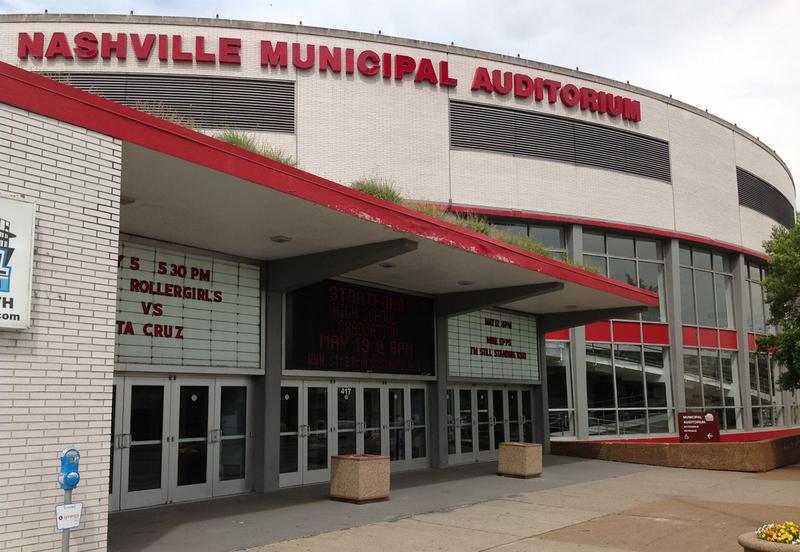 Nashville Municipal Auditorium, where I worked as an usher. My high school graduation was held there also, because it was the only building in town large enough to hold the families of 3,000 students. 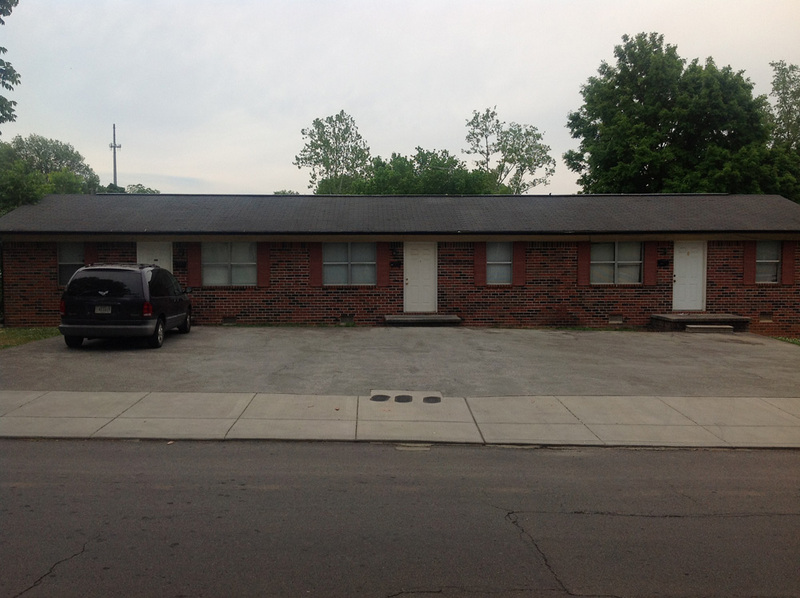 Somebody needs to get those weeds down off the roof. 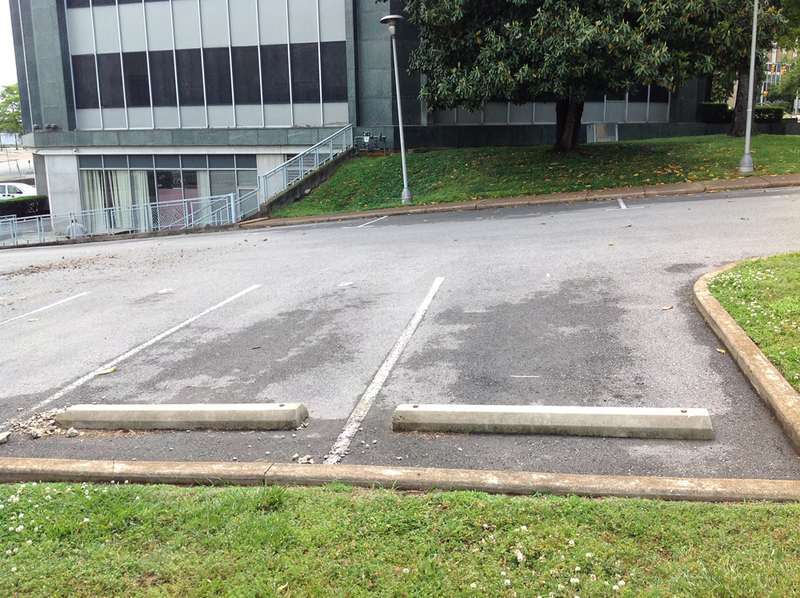 The parking spot on the left is where I parked my car the night I met David Bowie. I had to wriggle around in the back seat of the car to change out of my usher outfit and into my get-up for the concert. Luckily, the car my parents bought for my sister and me to drive was a (used) Buick Electra convertible, just a notch down in size from a Cadillac. I never understood why two teenagers needed such a car to get to school, but I never complained, either. Gas was cheap back then. 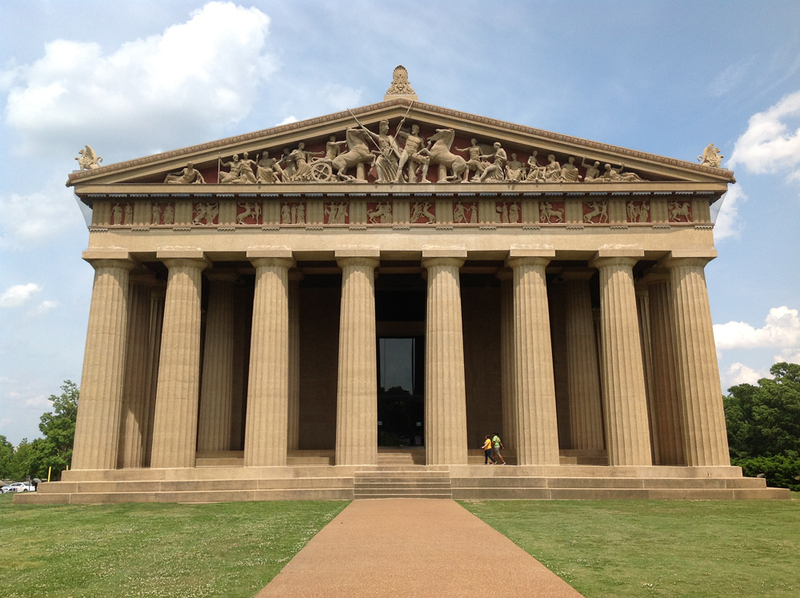 Nashville then and now. 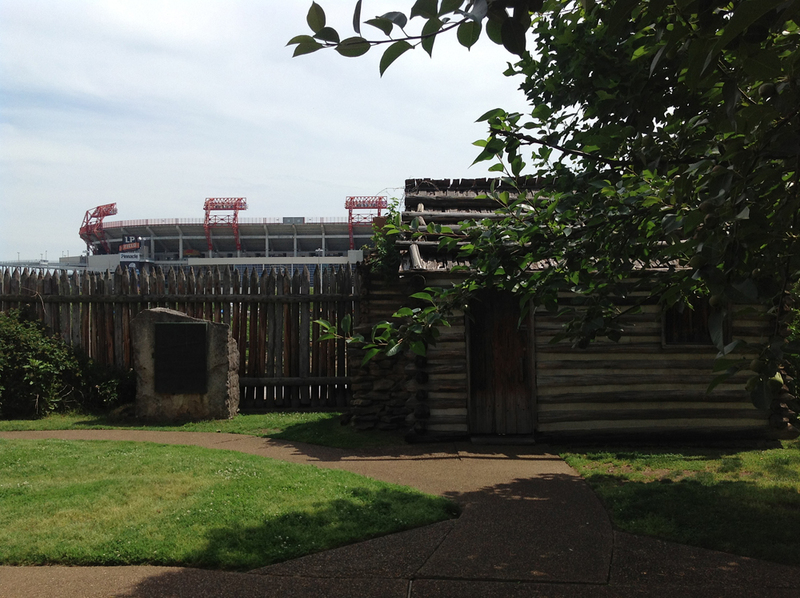 In the foreground is a recreation of Ft. Nashborough, the original settlement on the banks of the Cumberland River that would one day become Nashville. Looming in the background, across the river, is Titans Stadium. 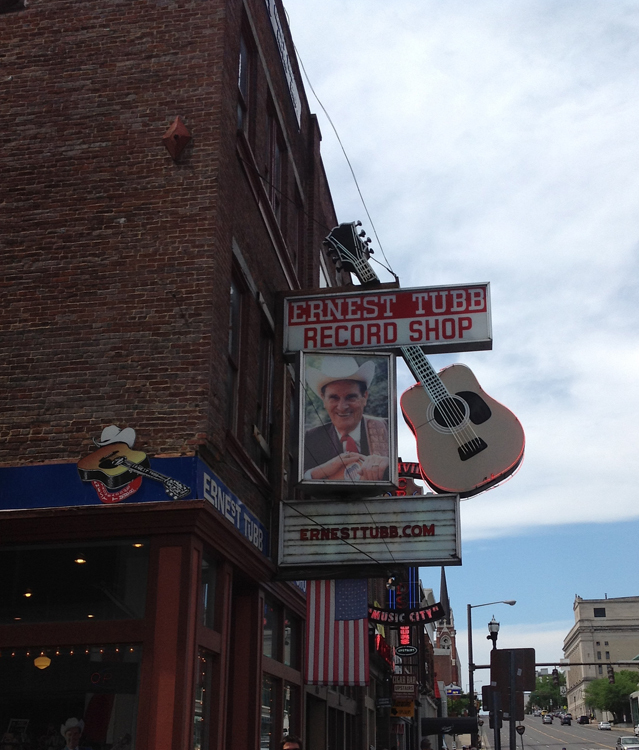 Ernest Tubb’s Record Shop, on Broadway. Years ago, all day long, 365 days a year, “Walking the Floor Over You” was broadcast from the record shop out to the honky-tonks and souvenir shops that lined the street we called Lower Broad. It drove Nanny crazy. Her last job was working as a cashier at the Rebel Trading Post, the bigggest souvenir shop on Lower Broad at the time. “So many people in there, you couldn’t stir ’em with a stick,” she would say when she got home in the evening. Lower Broad as it appears today. 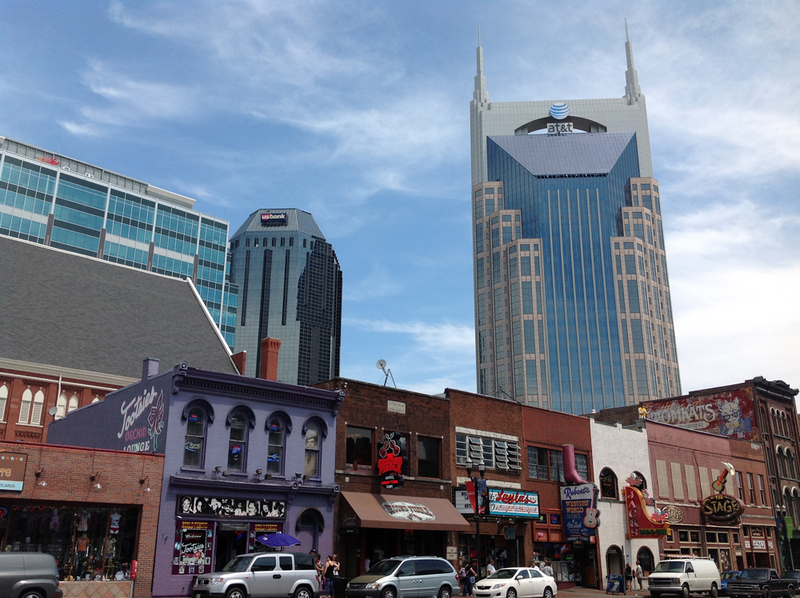 The purple building toward the left is the world-famous Tootsie’s Orchid Lounge, meeting place for decades of the great and near-great of country music. The AT&T Building looming over Lower Broad is known locally as the Batman building. For obvious reasons. Nasvhille then and now. 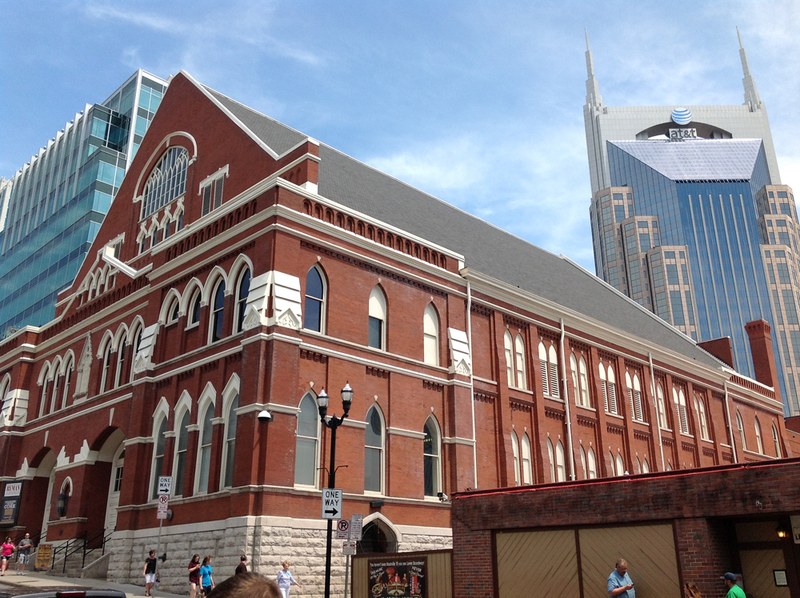 In the foreground is the Ryman Auditorium. It was opened in 1892 as the Union Gospel Tabernacle and became famous the world over as the home of the Grand Ole Opry from 1943 to 1972. When I was growing up, the auditorium was said to have some of the best acoustics in the world. It was also said to have a thousand pounds of chewing gum stuck to the bottom of the pews where the spectators sat. The inevitable Batman building muscles its way into the photo on the right. 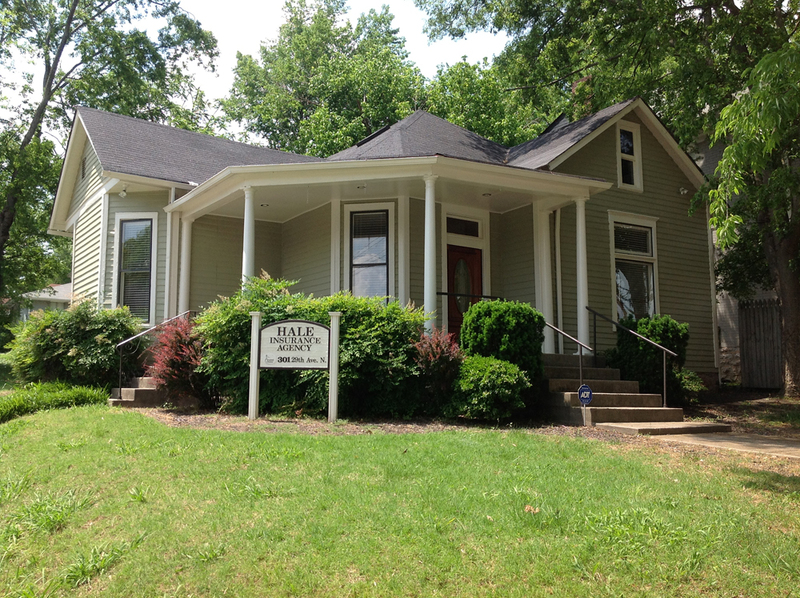 The former Hammelbacher Gallery, once home to Doug Wiliams and his marimba. 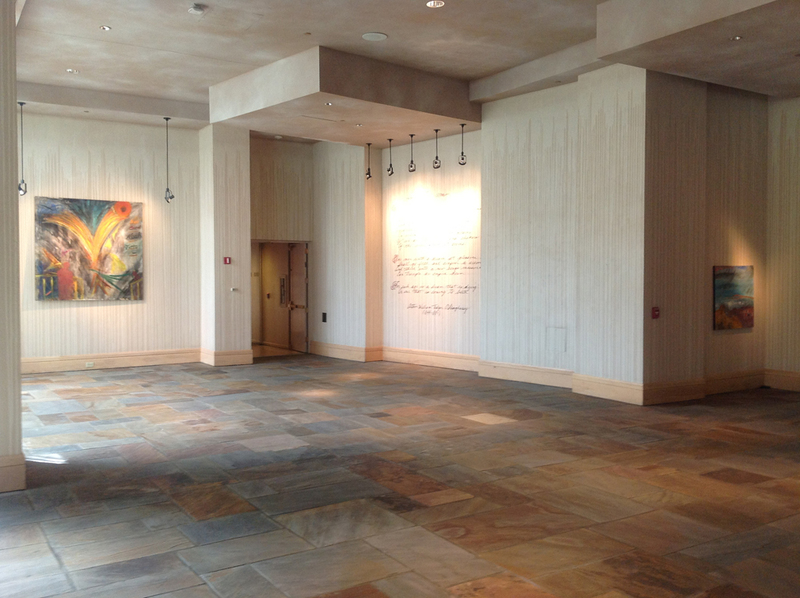 The lobby of BMI’s headquarters in Nashville. Doug decorated it. 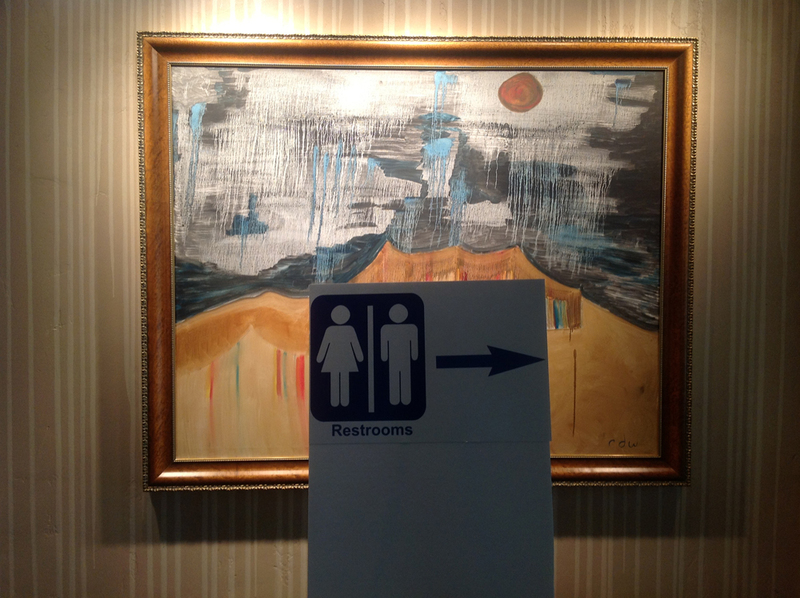 To the right and the left can be seen two of his paintings. 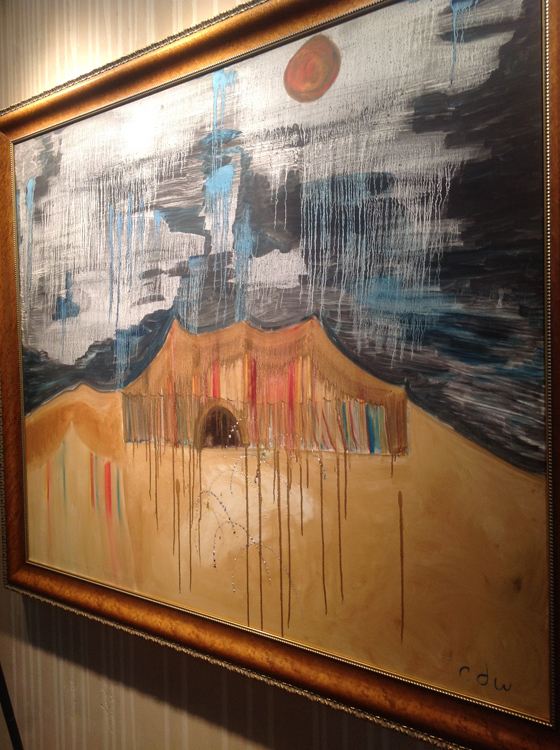 Another of Doug’s paintings at BMI. Doug was partial to tents. A full-on view of the tent. 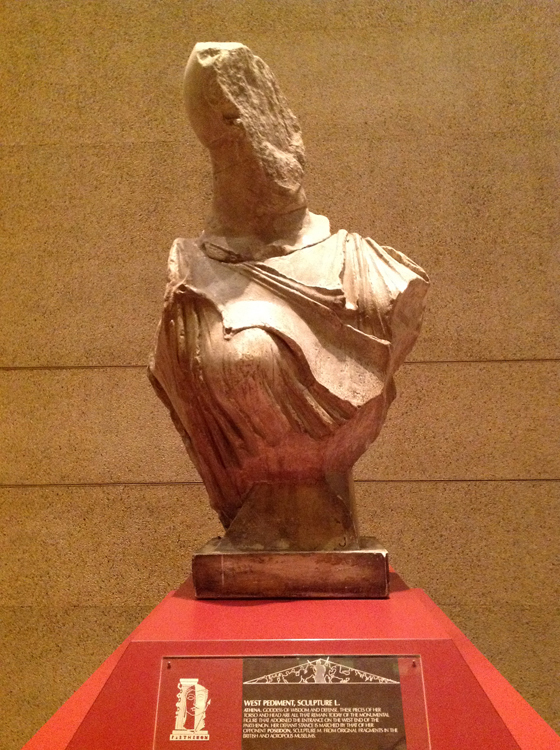 Far from being insulted, had Doug lived to see this, he would have laughed all day. 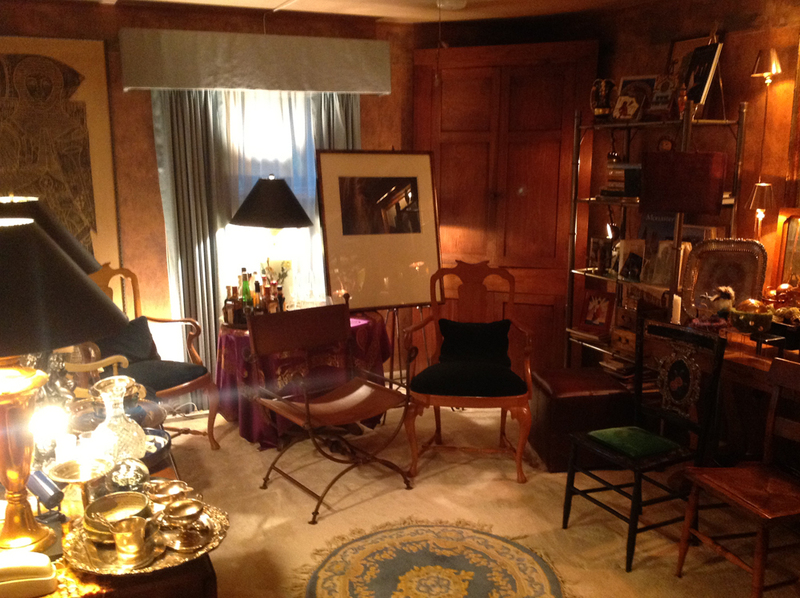 Kent Cathcart’s library. Very few books, very many chairs. This is where we gather for drinks before dinner at Kent’s. 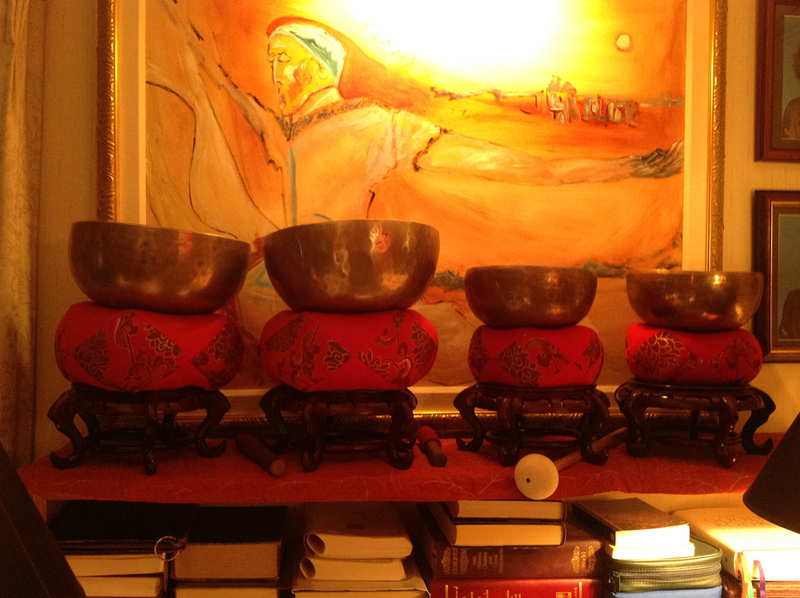 Tibetan singing bowls in Kent’s study. The painting behind them is one of Doug’s. 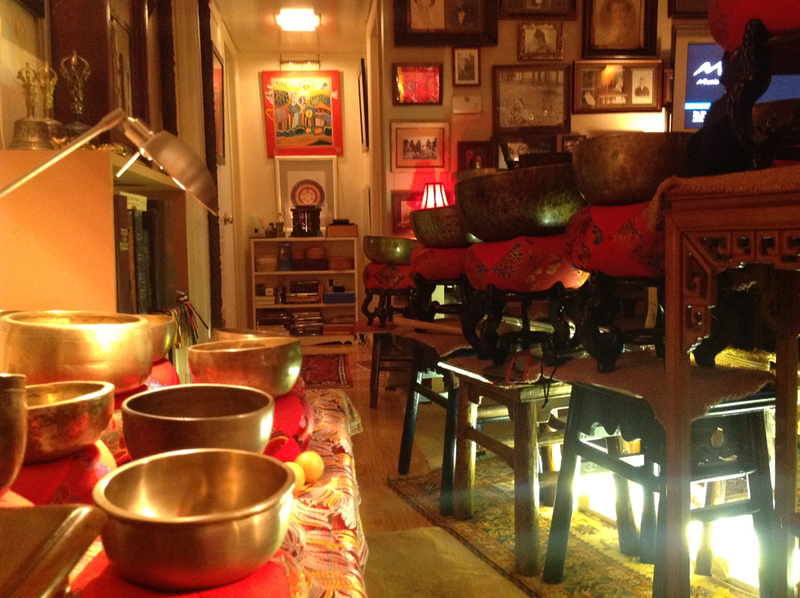 More, and more, and more Tibetan singing bowls. 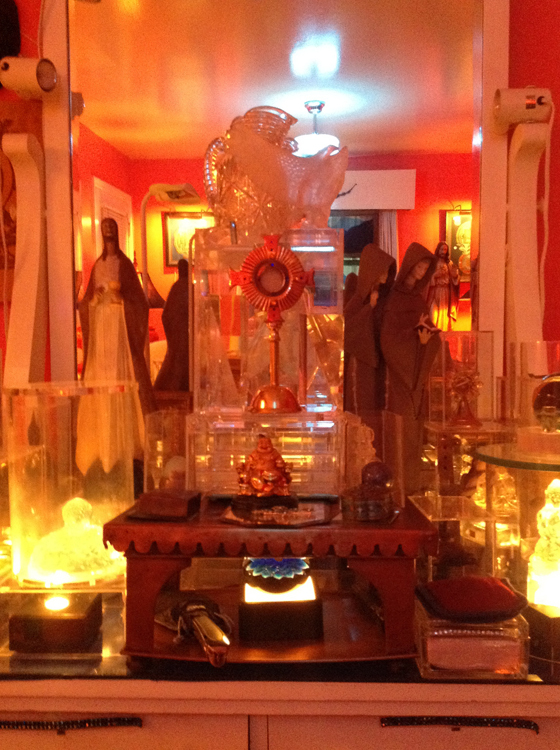 An altar, one of many, in Kent’s home. There are few manifestations of God on earth more adept at conjuring holiness than Kent.